Thanks to Cathy Gulli and Macleans for sharing this story about Ashley Donelle, a 20-something Montreal woman with Cystic Fibrosis who recently underwent a double lung transplant. The article charts Ashley’s suffering with CF, the transplant that saved her life and the ongoing health concerns that come with being a transplant survivor. The article also highlights Ashley’s health improvements since her surgery. Ashley words: “I had to train my brain that my body wasn’t sick anymore.” She is now blessed with good health. Health that allows her to live and celebrate life every day with her two children. More encouraging is what’s to come. Dr Francis Collins, one of the co-discoverers of the CF gene, is quoted in the article as saying, “I’m optimistic enough to say that it will be a story about a disease conquered.” That day can’t come soon enough. 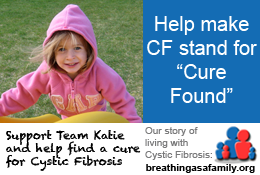 Many are optimistic that technology will yet prove to be a great equalizer when it comes to CF. A cure or control can’t come soon enough. Just ask those currently suffering from the disease. Over 3,600 CF patients require daily treatment to help stave off the effects of this fatal genetic disease. But for now, stories like Ashley’s offer motivation to those that find themselves challenged by the disease. Thank you Ashley for sharing your story. You truly are an inspiration.